Precious Savior, Redeemer, Lord Almighty, I worship you. I give You my heart today. Guide me, lead me, walk beside me, protect me wherever I go. I come before You to give you all the praise, honor and glory You deserve. Execute the plans You have in store for me, not only granting my heart’s desires, Oh Lord, but giving me all that I truly deserve. Heavenly Father, I won’t allow anyone on this earth to convince me I cannot do something. You have clearly stated in your Word that I can do all things through Christ who gives me strength. My dreams may be outlandish and unrealistic to the mere mortal understanding, but with You, nothing is impossible. You will turn my dreams into reality. I know everything will fall into place for me, in your perfect time. John 14:13-14 And whatever you ask in My name, that I will do, that the Father may be glorified in the Son. 14 If you ask anything in My name, I will do it. 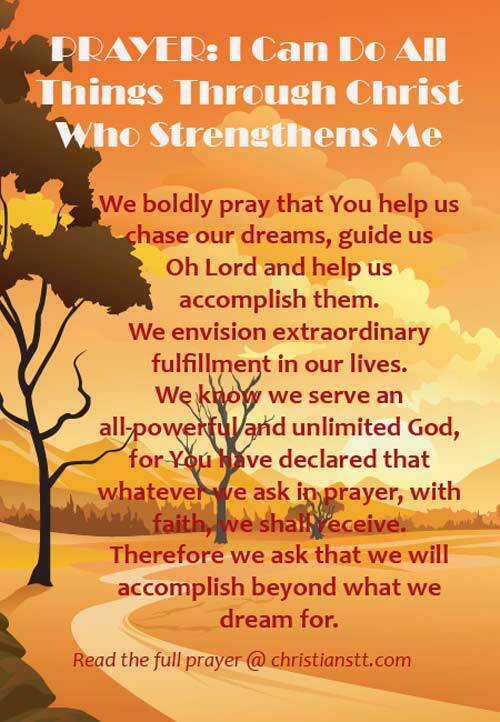 I boldly pray that You help me chase my dreams. Guide me, Oh Lord and help me accomplish them. I envision extraordinary fulfillment in my life. I know I serve an all-powerful and unlimited God, for You have declared that whatever I ask in prayer, with faith, I shall receive. Therefore I ask that you help me to accomplish beyond what I dream for, so that it will not only change my life, but it will change my community and even the world. I declare that all I pray for will come to pass, in Jesus’ mighty name, Amen!!! Declaration: My prayers are powerful and effective! 2 Corinthians 5:21 God made him (Jesus) who had no sin to be sin for us, so that through him we might become the righteousness of God.